This month, I completed my second New York City Marathon. While many friends and family members congratulate me for what they see as an impressive accomplishment, I see the experience as a privilege. Sure, it takes a lot of training to be able to run 26.2 miles in one stretch. I logged nearly 400 miles — and wore through a pair of shoes — in the four months leading up to the marathon. But once training is out of the way, the marathon itself is a 26.2-mile-long block party, made possible not only by my training, but by the enthusiasm of the 2+ million New Yorkers who line the streets to cheer on total strangers by name and hand out water, bananas, bagels, saltine crackers, candy bars, pretzels and paper towels. Because I had my name printed on my shirt, I heard “Go Vince, go Vince, go Vince!” for most of the five hours it took me to complete the course. I high-fived hundreds of spectators along the way. It’s no wonder I had a smile on my face as I ran through five boroughs, across five bridges and through countless neighborhoods, each with its own character. This year, the winds gusted up to 40 mph, but the crowds were still out. And we runners were enthusiastic, too. Nothing can full convey the excitement of the starting line, but for an idea of it, check out this video I shot just moments after a cannon signaled the start for those of us in Wave 2. What Does NYC Look Like on the West Coast? The hype of Brooklyn has reached San Diego, bringing to the neighborhood of Mission Hills a new representation of New York City. This quiet neighborhood of historic homes and independent businesses sits a few miles above downtown San Diego. 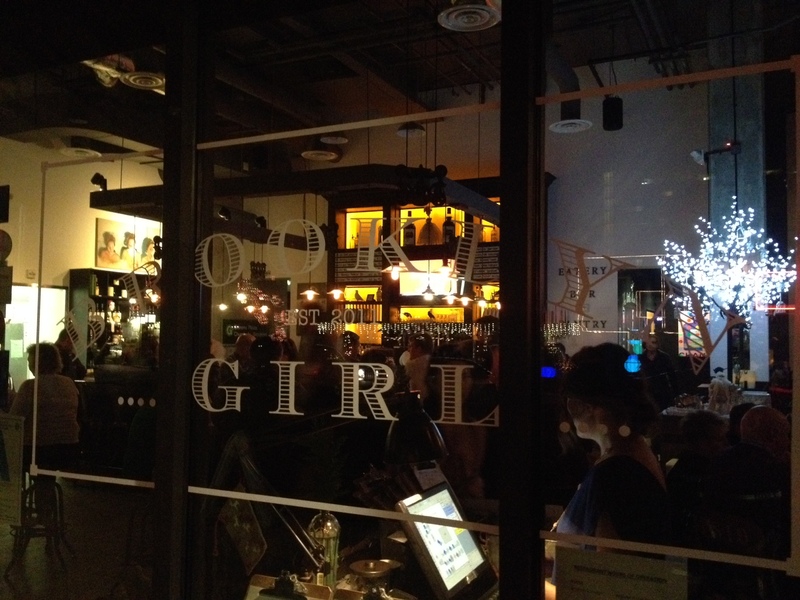 On frequent trips to Lefty’s Pizza, at Fort Stockton Drive and Goldfinch Street, I have always been intrigued by the restaurant across the street, Brooklyn Girl. 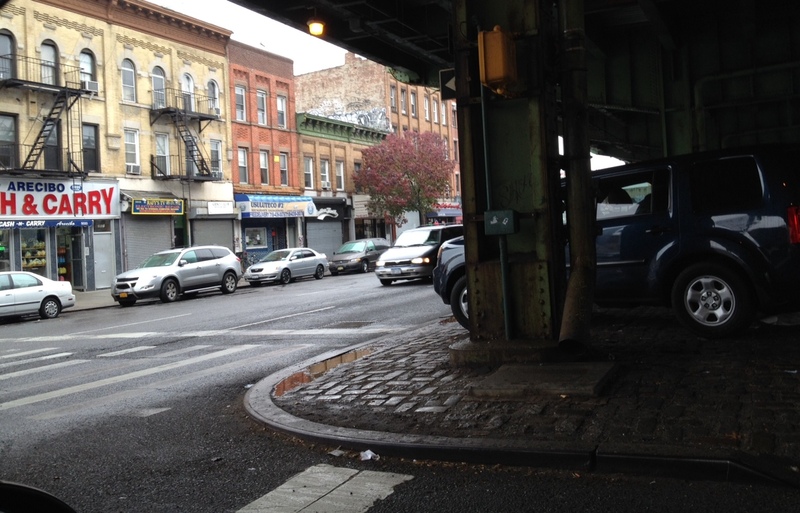 Few places in the city are as dark, isolated and ugly as Third Avenue under the Gowanus Expressway in Sunset Park. There are no thriving businesses or pedestrian traffic in the vast highway shadow. The pre-expressway Third Avenue that Robert Caro describes in The Power Broker bears no resemblance to the space today. Lining it … were seven movie theaters, dozens of tiny restaurants … and scores of small, friendly “Mama and Papa” stores (the Northland Gift Shop, the Finnish Book Store, a hardware store that looked like a general store out of the Old West, a butcher shop that raffled off twenty-five big turkeys every Christmas) that occupied the ground floor of three- and four-story brickfronts in which Mama and Papa lived upstairs with children. What many New Yorkers, especially more recent arrivals, may not realize, is that Robert Moses tried to impose a similar highway on to SoHo. He actually tried to impose several cross-town expressways throughout Manhattan, but the Lower Manhattan Expressway, or LOMEX, nearly became reality. The final struggle is especially compelling. The LOMEX project was touted as a needed economic boost to Lower Manhattan, and politicians were eager to make compromises to make the project happen—especially since the project would be funded almost entirely by the federal government. But Jacobs’ experience taught her that no compromises should be made, that concerned residents should accept nothing less than a full cancellation of the project. I have read (and highly recommend) The Power Broker, as well as Jane Jacobs’ most well known and influential book, The Death and Life of Great American Cities, but Wrestling with Moses fills in a lot of gaps, relating stories that were not covered in The Power Broker. Flint’s book told me a lot about Jacobs’ life that I would not have otherwise known. For anyone who has ever enjoyed a walk through Washington Square Park, the West Village or SoHo, this book is a great reminder of the difference that a small group of residents made in preserving vibrant city life for subsequent generations. 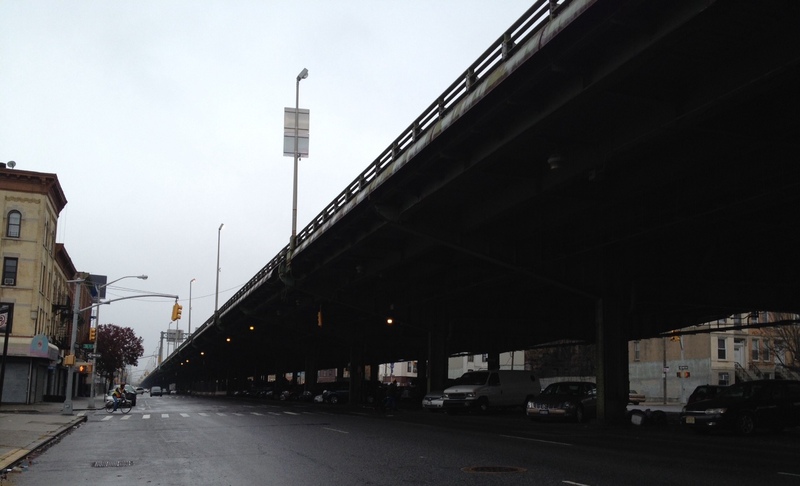 Below are some more photos of the Gowanus Expressway over Third Avenue in Brooklyn and the forlorn space below. Where’s the Chicago Beef, New York? 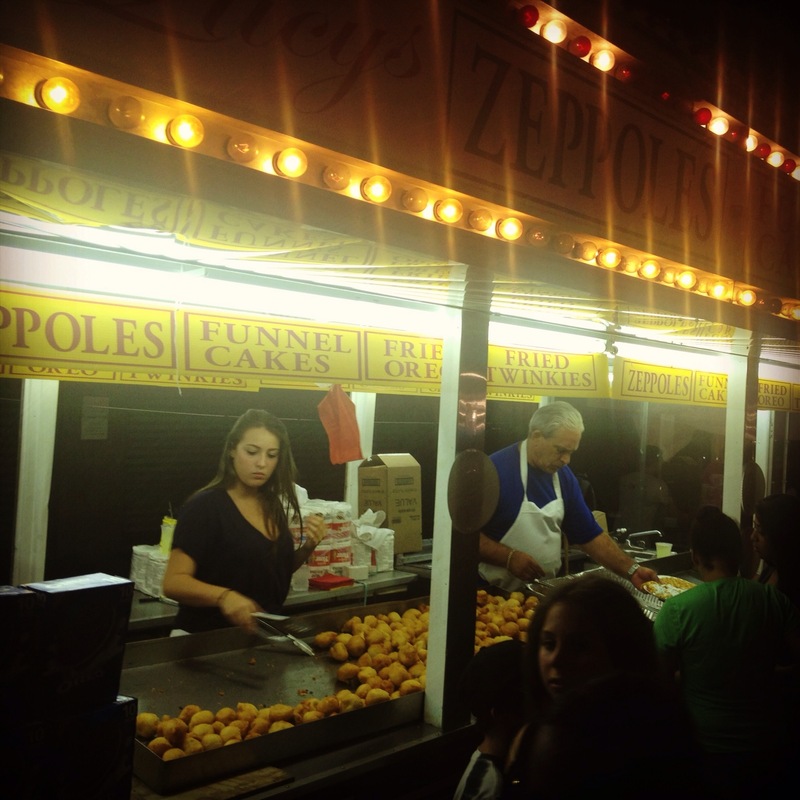 With more than 8 million residents, many of whom hail from all corners of the globe, there’s hardly an ethnic or regional specialty food that you cannot find in New York. From Norwegian to Sri Lankan, from Texas barbecue to Maine lobster rolls, we have it here. 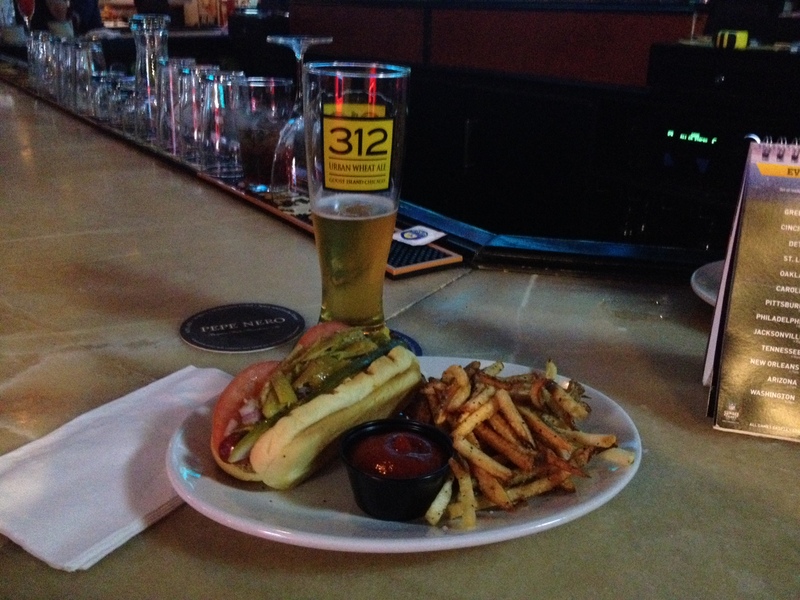 But one thing we don’t have is a Chicago Italian beef sandwich. “You mean like a cheeseteak,” people ask me? No, more like a French dip. A Chicago Italian beef sandwich is thinly sliced roast beef piled onto an Italian roll, and then covered with—or better yet, dipped in au jus—with either sweet peppers, hot peppers or both. The Italian beef sandwich requires two hands, plenty of napkins, and, frequently, a repertoire of minor acrobatics for catching every last drip. 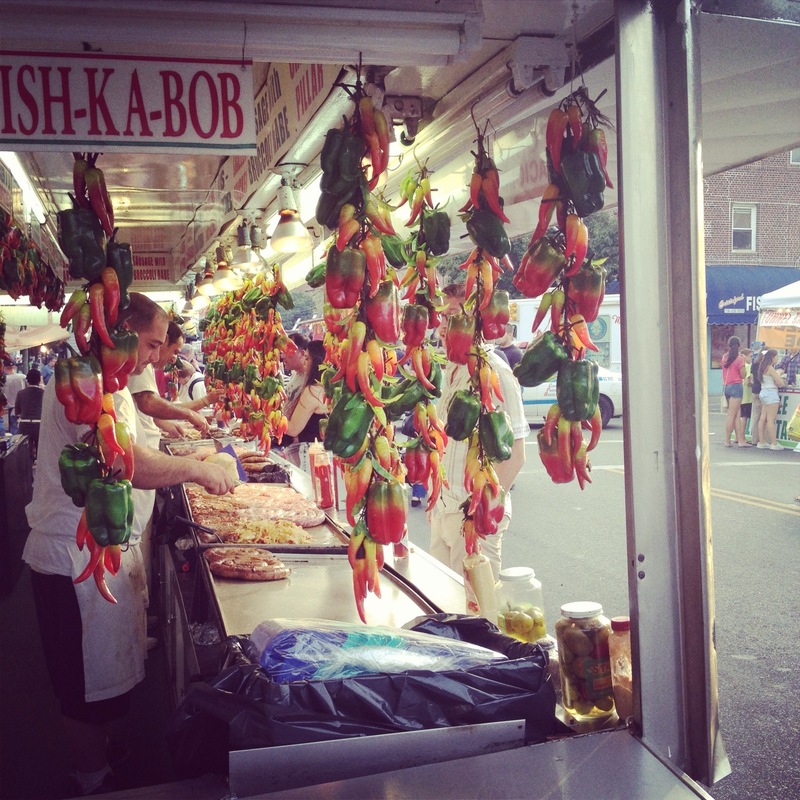 The sandwich can be found at “beef stands” all over the city and in the suburbs; Mr. Beef, Johnnie’s Beef and Al’s #1 are three perennial favorites. 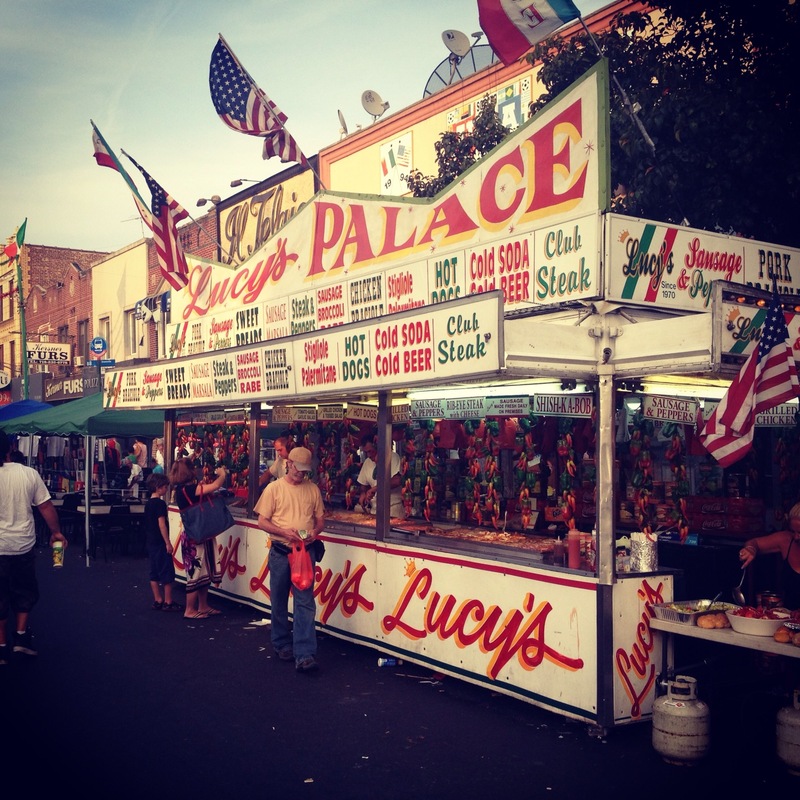 No one is quite sure where the Italian beef sandwich got its start. It most likely has its roots in the Depression years, when roast beef was a costly luxury and people looked for ways of making a little go a long way at banquets and weddings. Slicing the meat very thinly and piling it loosely on a roll or plate was a favorite method. In the years following World War II, Chicago-era meatpacking firms such as the Scala Packing Company on the Near North Side, picked up on this trend and began selling presliced roast beef to local restaurants, where early versions of the sandwich were presumably born. I lived the first seven years of my life in Chicago, and even after my family moved to San Diego, beef sandwiches were always close by. My family owned a pizzeria, where we served thin-crust Chicago pizza (not all Chicago pizza is deep dish! ), pasta, cold submarine sandwiches, and hot meatball, sausage and beef sandwiches. But in 2005, my family sold the business, and I moved to New York. I’ve spotted Big Al’s Chicago Pizza in the Financial District, but from what I see online, it’s not as Chicago as the name of the business implies. The only promising establishment on this list of places to buy Chicago beef is no longer open. A Chicago native opened up a beef sandwich shop in Linden, N.J., in 2006, but the shop did not last long. I reached out to the former owner last week, after being out of touch for several years, and he said he still makes special order Italian beef for those wanting at least 10 pounds of it—and that he would set some aside for me when he does his next order. In the meantime, I look forward to my annual December trip to Chicago. My family has adopted a ritual: My aunt picks me up from O’Hare Airport. When I get into her car, we call my great uncle in Franklin Park, and he heads out to pick up several beef sandwiches. We all arrive at his house around the same time, and my feast begins. I’ve also found Italian beef sandwiches in San Diego. And I’m sure they are available in Los Angeles, Phoenix and probably Florida, all homes to significant numbers of transplanted Chicagoans. But no Italian beef sandwiches in New York. The ceiling at Windy City Ale House is lined with Cubs, White Sox, Bulls and Blackhawks flags, along with the flag of the city of Chicago. Sports memorabilia and old black-and white images of Chicago fill the walls. The beer taps include several Goose Island brews. A lot of the guys at the bar last Wednesday were decked out in Blackhawk jerseys. 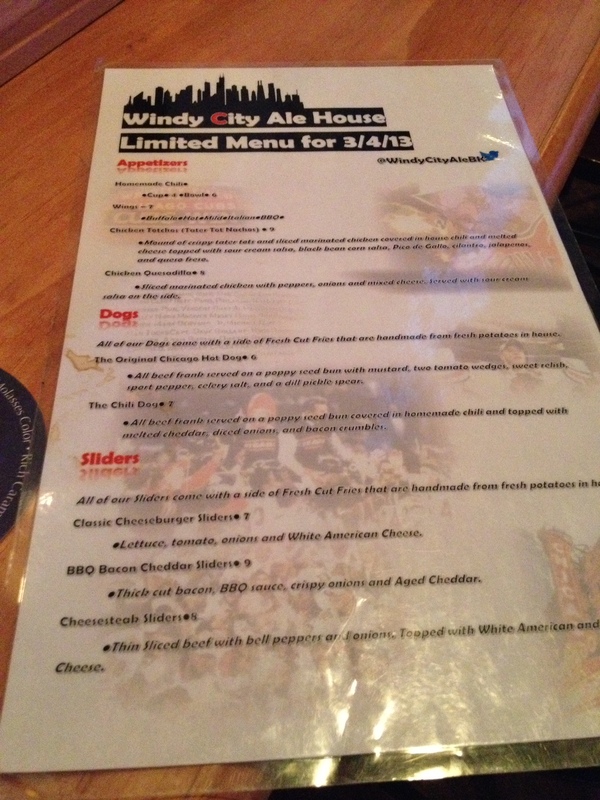 And the menu included Vienna beef Chicago hot dogs (which I ordered), but no beef sandwiches. I asked the owner if they might introduce beef sandwiches to the menu. He said the hot giardiniera peppers were his stumbling block. Unlike the hot peppers you find in Italian delis here, which are packed in water and vinegar, Chicago hot giardiniera are small green hot peppers, packed in a thick, spicy oil. The owner could not have them shipped from Chicago without ordering an impractical bulk amount. I imagine, too, that the logistics of preparing the beef might also be a stumbling block for him. This is why I can’t make it at home. I can cook a roast and make a good au jus, but I can’t slice the beef that thin without a commercial meat slicer. While I’ll continue to patronize the Bay Ridge bar, because it’s a little slice of home for me, the beef sandwiches will have to wait until my plane touches down at O’Hare. Unless someone can tell me that I’ve left a stone unturned? 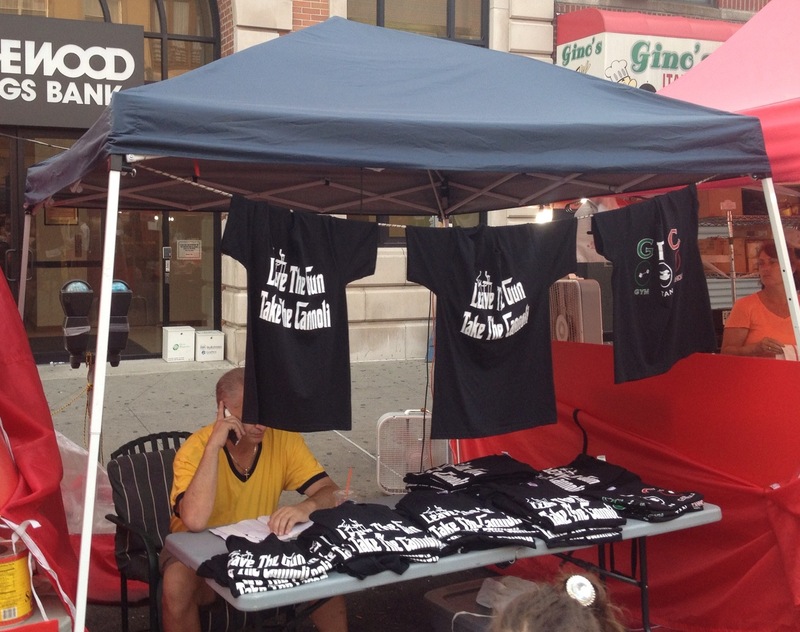 Yesterday marked the end of Bensonhurst’s annual Festa di Santa Rosalia, a street fair that honors the 12th Century patron saint of Palermo, Sicily. Held every year (except 2011, when a supposed paperwork error led to a cancellation of the event) on 18th Avenue between 68th and 75th streets for 70 years, the feast brings street vendors, carnival rides, music and a lot of food—Italian and non-Italian to this once predominantly Italian American neighborhood. 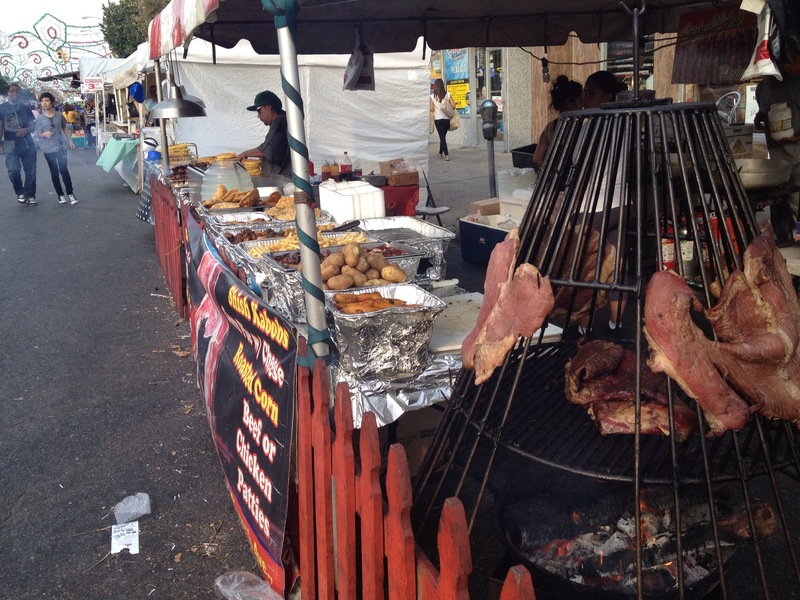 Though visitors to the 10-day feast will still see older men seated on folding chairs on the sidewalks outside old Italian social clubs, they will also see Muslim women walking down 18th Avenue wearing hijab, dozens of storefronts with Chinese writing and food vendors roasting flank steak under a Colombian flag. 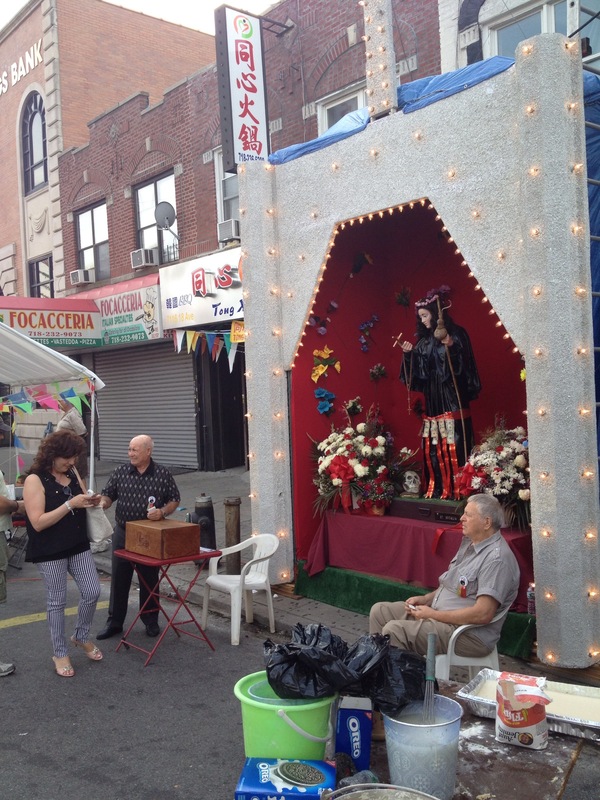 Eighteenth Avenue is still subtitled Cristoforo Colombo Boulevard, but even eight years ago, when I first visited the Festa di Santa Rosalia, the neighborhood had become a multicultural one. 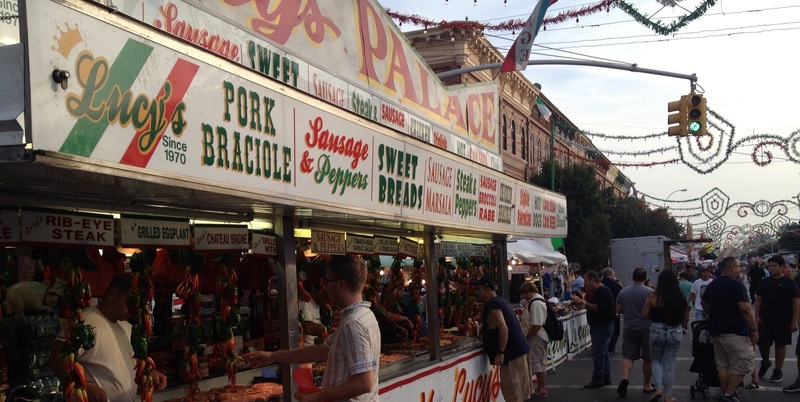 Unlike the much larger Feast of San Gennaro in Manhattan, which is produced by a contracted company, the Festa di Santa Rosalia is still put on by a local group, the Santa Rosalia Society. The feast honors the patron saint of Palermo, who lived and died in solitude as a hermit on Mount Pellegrino, three miles from Palermo. In 1624, during a horrible plague, her remains were dug up and processed through the city, putting an end to the plague. 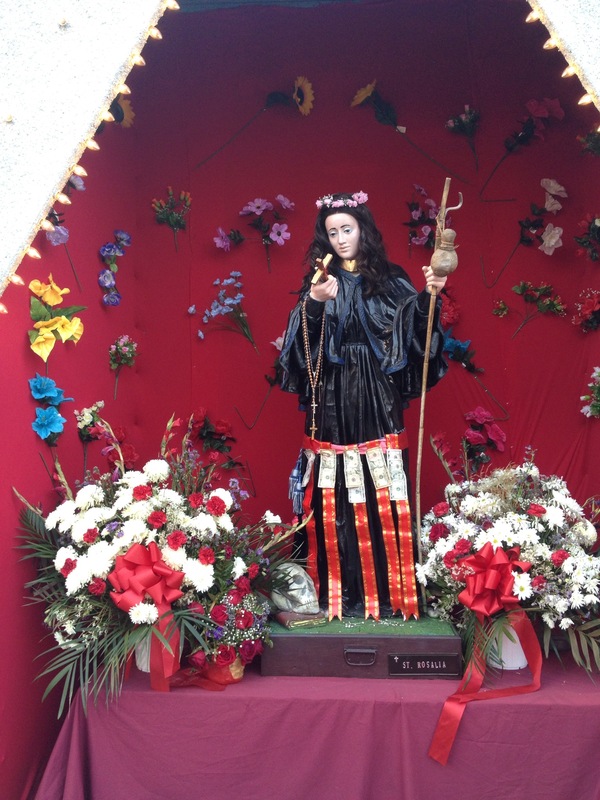 Today, she is still honored every year by Sicilians around the world, from Palermo to Brooklyn. 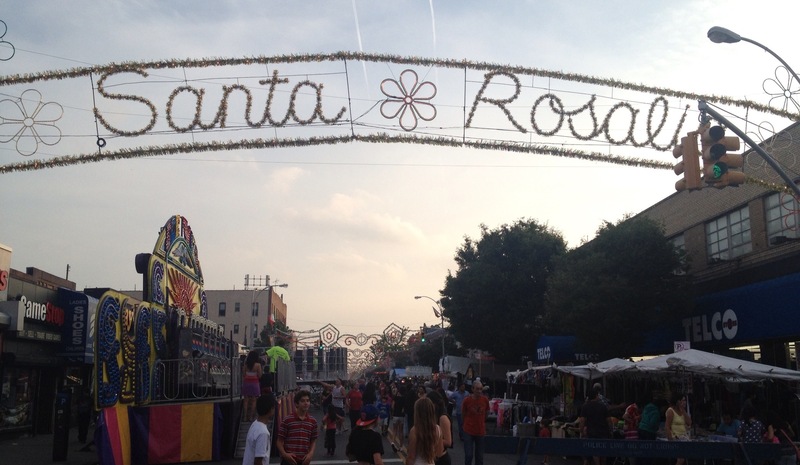 Below are some images from this year’s Festa di Santa Rosalia. 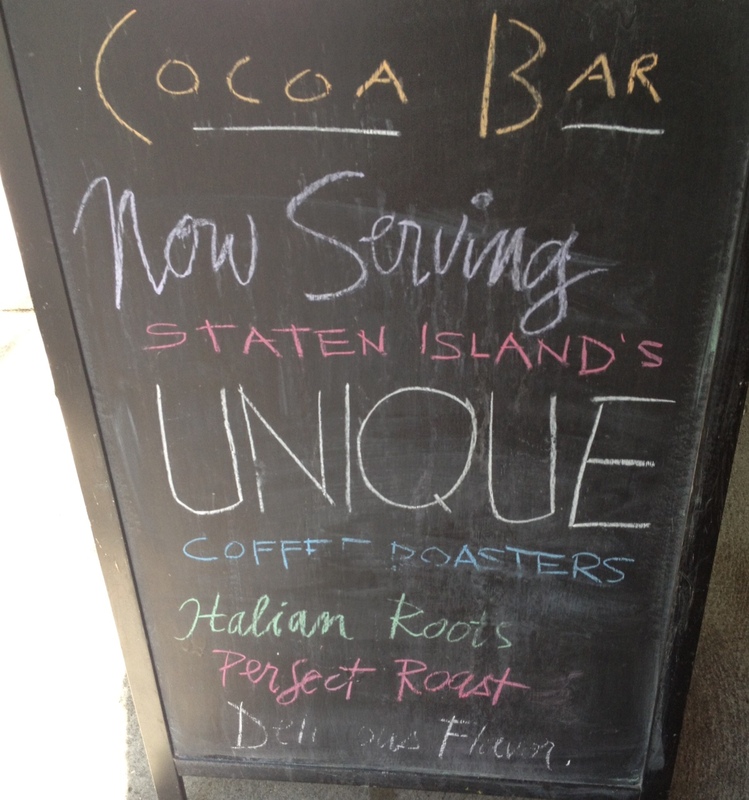 Park Slope Serves Coffee Roasted in … Staten Island? From emu-egg mayonnaise to beard oil, the Brooklyn brand runs rampant in this city. The proprietors of Cocoa Bar have apparently looked beyond their neighborhood to serve coffee roasted a good 13 miles—but really another world—away in Mariners Harbor, Staten Island. In September of 1995 [James] Ferrara incorporated Unique Coffee Inc. Starting in the garage of his home with the help of his father Al and wife Toni; they started the business. It was a lot of work, not having a roaster in his garage Ferrara’s first account was a gentleman in Brooklyn who had a small shop roaster that he rented time on. He would buy his green coffee; pick it up at the pier; drive it to Brooklyn; roast it; bring it back to Staten Island; package it; load the van; and deliver it the next day all while doing his own sales while on the route. At the time he was using his and his father’s garage along with their first Dodge van as storage; he then realized that it was time to move into a warehouse. Unique Coffee moved into their first warehouse in the Mariner’s Harbor section of Staten Island in 1997 which is where they purchased their 60 kilo roaster and believed that they would never grow out of the then very large space. While providing New York City with the finest coffee the business grew to a point where they again needed to find more space. In late 2000 Unique Coffee began the move to their current manufacturing facility and corporate offices where they operate today. Unique Coffee typically roasts 8,000 to 12,000 pounds of coffee during an eight-hour shift. They bag it by hand, then sell it from their website and in 4,000 retail stores around the country, including Stop & Shop, T.J. Maxx, Bed Bath and Beyond, Marshalls and Homegoods. Their beans can also be bought from 350 stores in Canada, 17 countries in Scandinavia and recently Korea and China. In addition to coffee under the Unique label, the roaster grinds private-label java for several supermarkets and gourmet shops in Manhattan. They also sell coffee to several local shops, including Royal Crown Bakery in South Beach and Pasticceria Bruno in West Brighton. Who knew that coffee roasted in Mariners Harbor was shipped around the world—and across the Narrows?